The complex of Mills, towering proudly over the sea, over the small hill southeast of Mykonos town. The Mills are located by the sea, between the picturesque Alefcandra and the settlement of Niohori and impresses visitors with their all-white imposing volumes, oriented to sea. Today, only seven out of ten are maintained (on the whole island at some point were more than twenty), which exist here since the first decades of the 20th century and used to grind the local wheat using the power of the north wind. 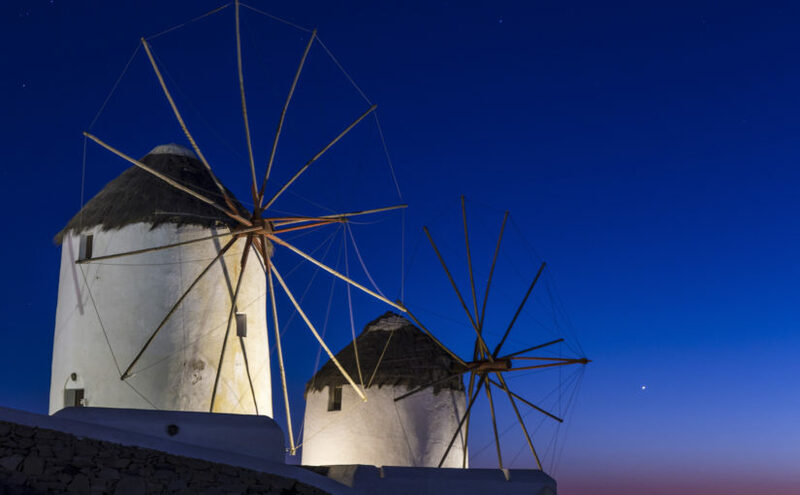 The windmills of Mykonos, early manufacturing units, contributed decisively between the 17th and 19th century at the financial strength of the island, because it was a necessary stop for passing sailing boats, in order to resupply with cereals. Losing their economic importance to the development of technology after the 1st World War, emerged as one of the most popular monuments in the Cyclades and their image as a "trademark", traveled all around the world. In 1700 the complex of 11 mills have already been developed and operated. Today, in the best condition is the Mill Geronymou (private), which operated until the late '60 and has maintained most of its equipment.